KNM is one of Malaysia’s leading service providers to the global oil and gas industry, its key activity being the fabrication of process equipment, terminals, refineries and processing plants. In 1Q11, bulk of its revenue was derived from Asia & Oceania (41%), Europe (54%) and Americas (5%) overseas contracts. Although orders visibility is rising, margin improvement remains a concern due to price undercutting activities at the mid-end segment. 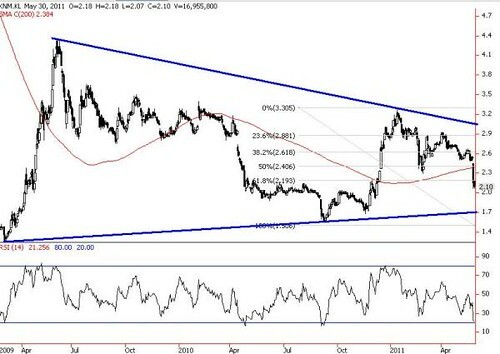 Following the breakdown below the 200-d SMA (RM2.38), mid Bollinger band (RM2.52) and lower Bollinger band (RM2.25) supports, KNM’s near term outlook remains bleak. 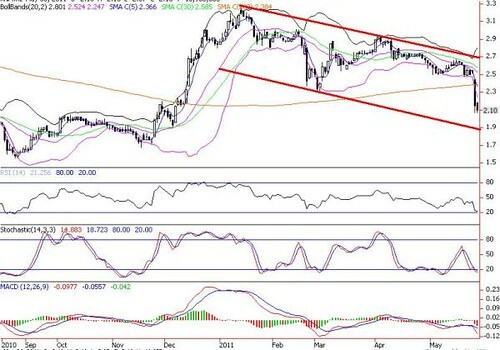 Further key support is 76.4% FR of RM1.93 (around the downtrend channel). If this support is violated, share price is likely to drive lower to long term UTL support around RM1.70. For risk-takers, a good level to accumulate is around RM1.93-2.00 for rebound play towards RM2.38 and RM2.52 levels. Cut loss below RM1.90.